Hmm... Scarborough: Did Obama sign off on the Lockerbie bomber’s release? Hmm… Scarborough: Did Obama sign off on the Lockerbie bomber’s release? 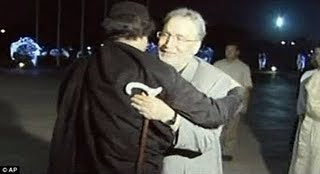 Lockerbie bomber Abdel Baset al-Megrahi was given a hero’s welcome when he arrived back in Libya. Would America’s great ally really notify the US that they were going to release the Lockerbie bomber (who killed 169 Americans) before his release? Every cable morning show discussed the story this morning, and it continues to be seen on CNN, Fox News and MSNBC today. “How would you feel if you were a family member of one of those people killed on that plane?” asked Fox & Friends co-host this morning, before playing a heart-wrenching clip of a father describing his son from earlier on the show. The lack of information, and the slow leak of new and explosive storylines, means the release will continue to be a major story in America. So, are we supposed to believe that Barack Obama knew nothing about Meghahi’s release? 169 of the 243 people killed in the bombing were Americans. So, is Meghahi really dying? There had to be some form of medical documents that were ‘supposedly’ presented to officials, so who signed them and what did they say? The British continue to say the American’s were informed of this release, will they name the names of the Americans?